Prestigious and 103 Films team up to bring the music video for his latest single ‘The Man’. Prestigious opens the video showing a more humorous side of his personality in a small skit with a skeptical girlfriend. They trade questions, jokes, and barbs that cause for a great introduction to the track. Prestigious displays a lavish life of luxury here as his wardrobe, companions, and location are of A1 quality. You can see the laid back confidence exuding from Prestigious as he delivers each verse. ‘The Man’ captures the feeling of living each day like it’s a movie and stopping at nothing to succeed. 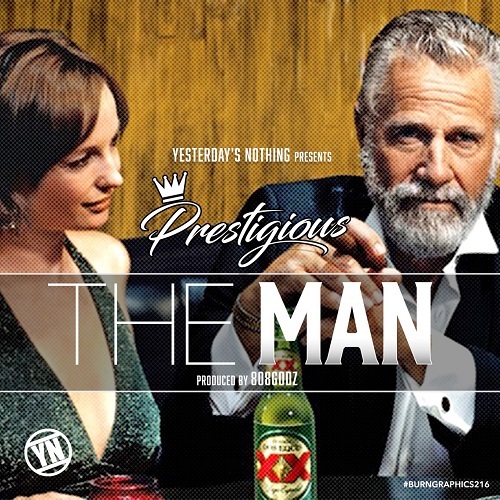 Prestigious is back with his latest release ‘The Man’, a melodic track boasting a confident yet laid back vibe. 808godz provide the production and the instrumental is a piano led, relaxing sound that instantly catches ears. Prestigious approaches the track with a proud attitude, speaking of his ability to succeed despite any obstacles. Prestigious also shows his diverse skill base as he brings more of a singing tone on this record. This track is a reminder to stay cool in every situation and approach each day with the goal to achieve.